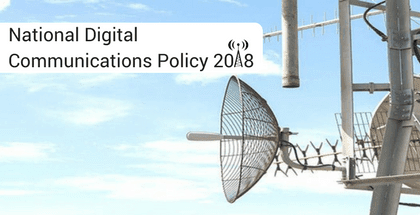 The Department of Telecommunications (DoT) has released draft of new Telecom policy – National Digital Communications Policy, 2018. This policy aims to unlock transformative power of digital communications networks to achieve the goal of digital empowerment and well-being of the people of India. It aims to enhance contribution of digital communications sector to 8% of India’s GDP from around 6% in 2017. It is an initiative by the Govt. to set up an effective institutional mechanism to protect consumers’ interests. This includes a Telecom Ombudsman and a centralised web based complaint redressal system. Under the ‘National Broadband Mission – Rashtriya Broadband Abhiyan’ government has also set a goal to provide 1Gbps of internet speed to all gram panchayats in India by 2020. Use of renewable energy technologies in the communications sector will be encouraged. The Government will also prepare a roadmap to explore and utilise the opportunities presented by next generation-networks like 5G and emerging technologies like artificial intelligence, internet of things, robotics, cloud computing etc. Question 1. Which Minister is currently handling charge of the DoT (Department of telecommunications)? Question 3. When was the Telecom Commission set up?